Do you have an idea what a Brand Promise is? 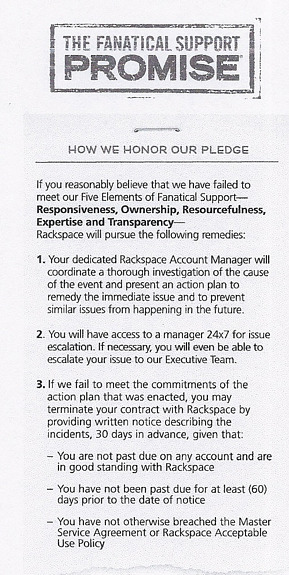 A recent article I read (Keeping your Brand Promise) from a search on Brand Promise doesn’t come close to the definition Mastering the Rockefeller Habits author Verne Harnish recommends, and is nowhere near the examples of Brand Promise we share with our customers (Read an example of Rackspace’s Brand Promise here). Many years ago when I was in sales in radio I believed that offering my customers the knowledge of how to create a Unique Selling Proposition would differentiate them and provide something similar to a Brand Promise. Yet a USP or Value Proposition isn’t nearly as compelling as developing a Brand Promise. Few businesses have a Brand Promise. It may be because it’s not only difficult to develop, it’s also difficult to quantify and guarantee. Most companies don’t make the investment in time and energy to develop a brand promise because its effort can be so fleeting due to changing market dynamics. Technological advances almost certainly mean any competitor can duplicate your promise given enough time and energy, thus eliminating your Brand Promise advantage in an instant. As discussed in this space before a Brand Promise needs to be both measureable and competitive. By competitive it should be differentiating. The most important element in developing a Brand Promise is to make sure it recognizes what your customer needs and how you intend to be different in the marketplace. That alone discourages businesses from even initiating the Brand Promise discovery process. You must realize that customers can want you to death, but when it comes to needs, there are specific elements or characteristics customers look for from any business that provides the goods or services you do. Your job is to determine which needs you provide better than you competitor. Or which needs your business is best suited to provide at a high customer satisfaction level. What’s interesting is you often don’t need to be the best at solving the customer’s needs. Because your competitors rarely make this effort to understand and build a measurable Brand Promise, you can identify a need and establish your position with a Brand Promise Guarantee and displace them as the leader with that need, simply because they fail to solidify their position with a Brand Promise guarantee and effective marketing position. My recommendation would be to begin your discovery process by reading and completing the steps outlined in Robert Bloom’s Inside Advantage. You must first determine WHO your customer is. Then determine your WHAT, HOW, and IMMAGINATIVE ACTS. That’s how you determine first WHO your customer is. Is there anything more important than defining WHO your customer is? Once you’ve developed your Inside Advantage you brainstorm “what’s the customer need?” It would be good to have a facilitator here. Often what occurs here is a cursory attempt to discover customer needs. The leadership group, or marketing people, can be so close to your business customer needs and wants they can be confused. Needs are primary, wants are the bells and whistles. Think of McDonalds compared to Ruth’s Chris. A facilitator can often separate these two elements better than those close to the product or service you offer. Come up with a list of needs and have your group vote on which of these are the most important for your customers. From there decide which of these needs are already being served by your competition. The key here is to realize your competition may or may not be doing a better job of serving your customer with this need. What’s important is can you serve it as well or better, and do they own that position with your customers already? If they own the perception in the market with customers, then immediately abandon that choice as a need you can provide. Another key is to realize that the customer’s need must match what you do best. Do you have the systems in place to support the customers need? This is another reason businesses abandon this approach. Their systems aren't consistent and predictable enough to satisfy and guarantee customer fulfillment. 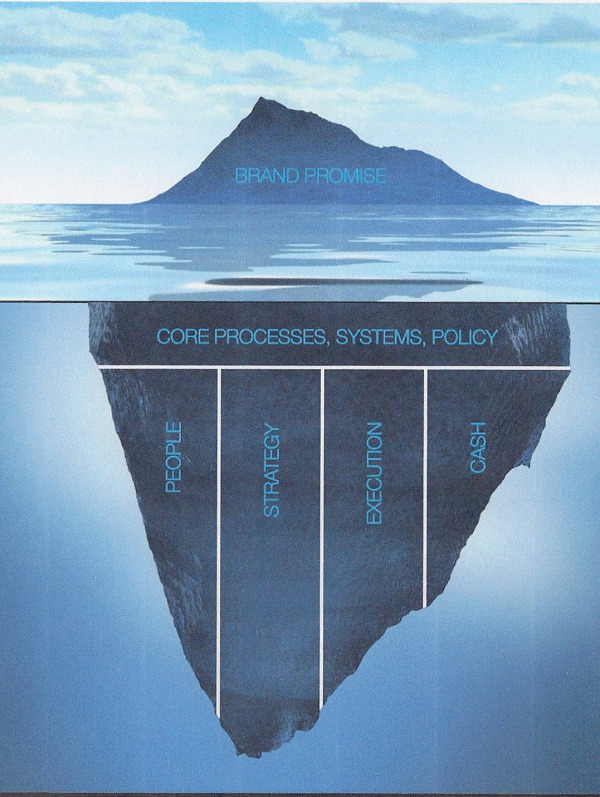 Your brand promise is simply the tip of the iceberg. You must have the supporting systems and commitment to consistently perform on your promise. A brand promise should have a lead promise and two supporting promises. It also needs to be measureable. 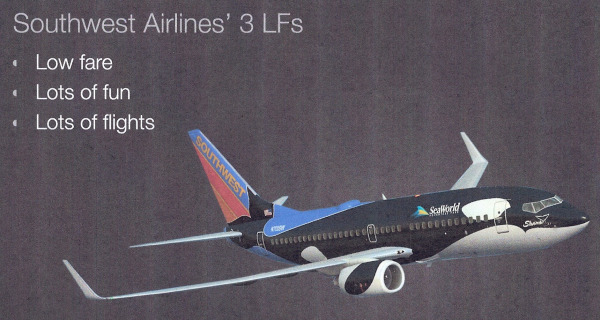 Southwest Airlines is one of the best examples of a successful Brand Promise. 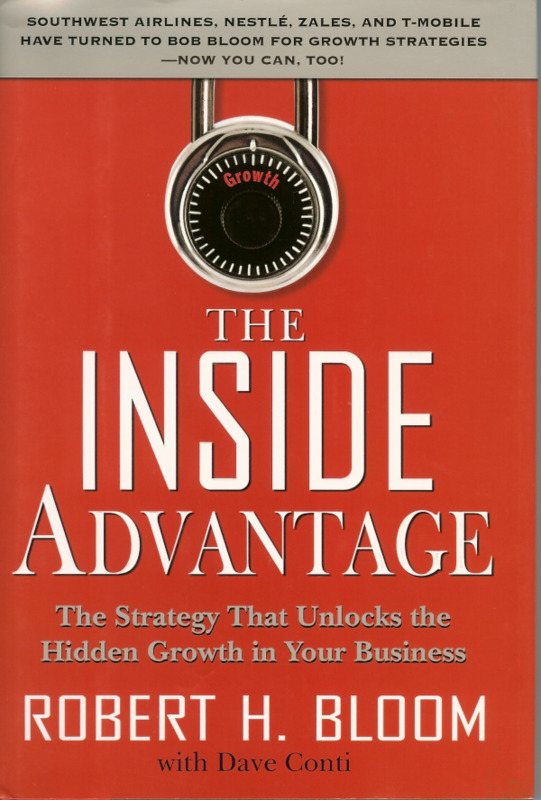 The original makings of Southwest Airlines are clearly described in The Inside Advantage, since Robert Bloom’s agency was originally responsible for their initial ad campaign. At the time [early 1970’s] the dominant travelers were male. They understood their customer and set out to define the airline as a “witty, pert, with it, startling woman.” It’s a strategy that wouldn’t work today and might even appear comical looking back now, but it worked powerfully then. In addition they looked at their competition and recognized many guys were paying a great deal to travel long distances in Texas to sell their goods and services. Not only was their competition expensive they were also unreliable. They launched their flights from San Antonio to Dallas for the then unheard of low price of just $15. They also offered something else their competitors weren’t doing – love. Barniff, their major competitor, lavished attention on their first class passengers but ignored the coach class. Southwest gave customers caring attention and service, plus delivered it with some very attractive sexily packaged female flight attendants. They provided a powerful tangible benefit as well, on time performance. It may have been the perfect emotional and tangible benefits – love, low cost on time performance. The key to knowing that you’ve got a great Brand Promise is that you say “no” more than you say “yes”. When you’re a growing company, it’s easy to say “yes” to every opportunity that comes your way, but doing so will kill what you’re trying to create. The whole point of a Brand Promise is that it’s your guiding light, and helps you make the right decisions, at the right time, for the right reason. Here’s a great example of how Southwest has stuck with their Brand Promise. You won’t see Southwest on Price Line, Travelocity or any of the other airfare discount sites. The only place you can get Southwest fares are on Southwest.com. Even though it means customers have to specifically request Southwest and the travel agent have to call and see what was available. It’s helped Southwest preserve their low fare advantage. Another great example has to do with a customer complaint. One day the CEO got an email from a customer, who was complaining that the flight attendant was being “funny” during the announcements for air safety. She thought the attendants needed to be “more serious”. We’ll be discussing Brand Promise at Mastering the Rockefeller Habits Four Decision Workshop. Download the Mastering the Rockefeller Habits Four Decision Workshop flyer. Register to attend this event November 12th in Cedar Rapids. Next blog more Brand Promise examples with a specific focus on Positioning Systems Brand Promise.